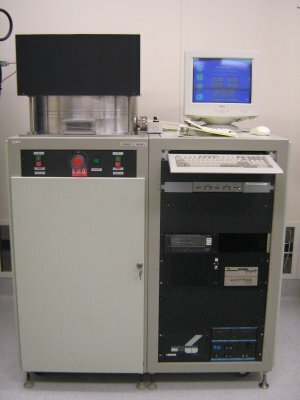 The Axic RIE (Reactive Ion Etcher) is a computer controlled plasma etching system. The system is equipped with a 500W RF power supply and turbo pump for low pressure or high gas flow rate etching. The system currently has oxygen, argon, and CF4 gas. Oxygen and argon are used for high powered stripping or etching of organics, and the CF4 is used for etching nitrides. The system has a 12 inch platen so very large samples can be etched or many small samples simultaneously. The system is equipped with an automated impedance matching network for automatic plasma tuning. Custom recipes can be created and stored on the computer. Each program saves the etch power from 0-500W, etch time from 1sec - 98 hrs, gas flow rates from 0-99 cfm, and process pressure in mTorr.